Are you looking for North Dumdum Municipality Group D form? If yes, here is the right place for you. 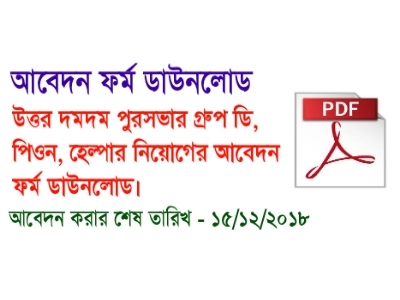 North Dumdum Municipality Group D, Mazdur, Helper application Form 2018 provided here. Now, you can get all Competitive Exam application form here. North Dumdum Municipality Group D Recruitment 2018 Application form below here. Qualifications : Class VII Pass.